Very Nice Little Runner, Ideal for a New Driver, with Electric Windows,Aircon, Part Leather, Radio/CD Player, Bluetooth, Tinted Glass, 2 Lady Owners, 5 Toyota service stamps and just had a service, 12 Months MOT witth no advisories, HPI Clear, 2 Keys, 3 Months Warranty, VERY NICE CLEAN CAR IN EXCELLENT CONDITION., FINANCE CAN BE ARRANGED THROUGH RECOMMENDED FINANCE COMPANIES +++ ALL CREDIT CARDS ACCEPTED +++ PART EXCHANGES WELCOME +++ DRIVE AWAY TODAY WITH OUR COMPLIMENTARY 5 DAY INSURANCE PLAN. VIEWING STRICTLY BY APPOINTMENT ONLY. PLEASE CALL US ON 0208 908 4957 (during working hours, Monday-Friday) or 07970 743 554 anytime up to 8pm every day, PRIOR TO VISITING to make sure we have the vehicle ready for your inspection at our office. Please call us for more information about this vehicle or to make an appointment to view it at our premises in Harrow, Middlesex. For directions, please go to www.firstnationalcarsales.co.uk and look up under "CONTACT". WE ARE AVAILABLE 7 DAYS A WEEK, STRICTLY BY APPOINTMENT ONLY. One of the world's automotive giants, Japanese manufacturer Toyota has a proud history of building reliable, well-equipped vehicles that always perform. No matter whether you're searching for a compact family car or a new off-roader, there's sure to be a used Toyota for sale in Harrow to meet your needs. Discover the compact AYGO, find yourself behind the wheel of a rugged used Land Cruiser, or enjoy the thrill of pure power offered by Toyota's GT86 coupé. 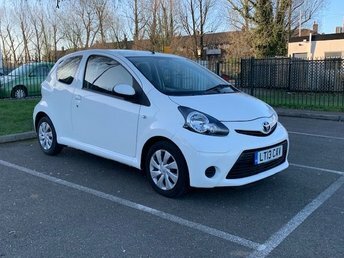 You'll find the complete range of used Toyota models available through First National Car Sales UK Limited listed right here on the website. Contact a member of our showroom team to find out more and to book a test drive in the vehicle of your choice.